Use coupon "STASH-40" on Mass Gainer 1.5KG and get £4.60 in coupon. Use coupon "SAVE-20" on Mass Gainer 1.5KG and save 20%. Use coupon "SAVE-20" on Mass Gainer 2Kg and save 20%. Use coupon "STASH-40" on Mass Gainer 3KG and get £9.07 in coupon. Use coupon "SAVE-20" on Mass Gainer 3KG and save 20%. Use coupon "STASH-40" on Mass Gainer 4.5KG and get £13.40 in coupon. Use coupon "SAVE-20" on Mass Gainer 4.5KG and save 20%. Is bulking up one of your current objectives? Are you one of those “hard gainers” with quick metabolism? Or maybe you are just too busy to plan and keep to a well-balanced healthy diet? Then search no further – Zumub Mass Gainer has been created to become your body’s fuel on the way to the desired result. Either a beginner or a guru with years of experience will find this high protein shake an irreplaceable asset to enhance muscle growth and support post workout recovery. 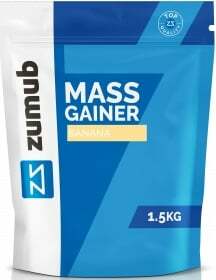 Unlike many similar products on the market, Zumub Mass Gainer does not rely on “bad” calories to provide you with energy. Instead it employs high quantities of whey protein to help you build muscle, not fat. Zumub Mass Gainer contains 1 gram of protein for each 2 grams of carbohydrates, being the leanest and highest quality gainer in the market. If gaining muscles and increasing your strength is something that you are looking for; if finally having the body of your dream is something that will make you happier – then Zumub Mass Gainer will take you steps and steps closer to your destination. As a supplement, consume 150g 1-2 times a day. Mix powder with 500ml of milk, water or your favorite beverage. Consume between meals and always post workout. WARNINGS Mass Gainer : Do not exceed recommended dosage. Keep out of reach of children. The product should not be used in case of hypersensitivity or allergy to any of the ingredients of the formulation. Food supplements should not be used as a substitute for a varied and balanced diet and healthy lifestyle. Contains sweeteners. Store in a cool, dry place. Please Recycle. BEST BEFORE: Please see lot number and expiration date stamped on the packaging.